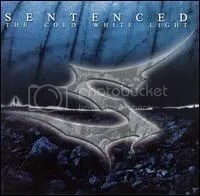 Sentenced was a death/black metal, but then came The Cold White Light, their supposed “sell out” album where they lightened up and became more melodic. I’m not a death metal fan, so I haven’t even attempted their earliest material. I was only drawn to this one because many metalheads claimed it was a “pop metal sellout” album. I say what’s wrong with pop metal? The answer, according to this album, is absolutely nothing. This isn’t pop metal in the 80s hairband sense, but the tunes are definitely catchy and have been stuck in my head for years since first hearing this album, and that’s a good thing. I don’t think they’ve changed their subject matter though, the songs are still about suicide, death, and death by suicide, to the ludicrous extreme as in “Excuse Me While I Kill Myself” where Laihiala sings “I kill myself, I blow my brains onto the wall, see you in hell”. I can’t imagine anything being sung like that in a matter other than tongue-in-cheek though given that it’s actually a catchy chorus. Still, this definitely isn’t a “fun” album, these guys are from Finland after all, where the suicide rate is extremely high, so though it definitely rocks, you can’t help but let the lyrics seep into your brain, so this isn’t something I like to crank during the summer while I’m crusin’ down the road. “You Are the One” is actually a positive love song (not a ballad), though. A fine album when I’m ready to be angry and all depressed and stuff.